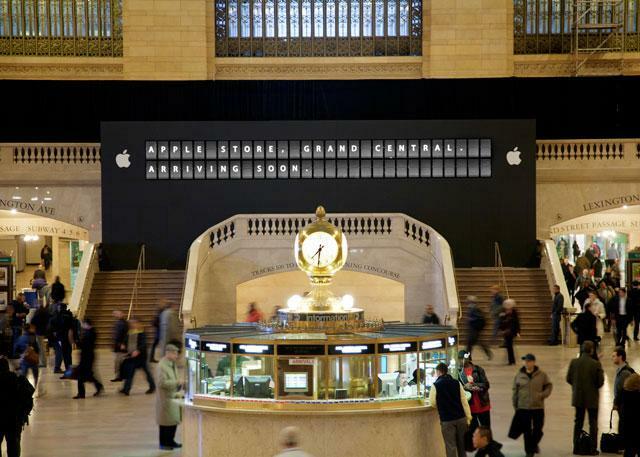 Apple has begun advertising that its new retail store at New York's Grand Central Station will be "arriving soon," while a new rumor claims the store will open on Dec. 9. Apple's public relations team sent a photo of a new display outside the still-under construction location on Wednesday to Gothamist which reads: "Apple Store. Grand Central. Arriving Soon." No official grand opening date has been given, however. But an anonymous source told the New York Post that the store is on track to open on Friday, Dec. 9. A media event is apparently being planned by Apple and railroad officials for that date, though the initial opening could be a VIP-only event with a public grand opening on Saturday, Dec. 10. "Railroad officials are busy preparing for the throngs of Apple enthusiasts that are expected to swarm into Grand Central for the opening —in addition to the 700,000 commuters that pass through on any given day," the report said. Earlier rumors inaccurately pegged a potential grand opening for this Friday, also known as "Black Friday" in the U.S., which is the biggest shopping day of the year. A construction worker at the site, however, reportedly indicated on Tuesday that the store will open in weeks, not days. But Apple apparently plans to have the massive 23,000-square-foot store open in early December, giving it plenty of time to sell products before Christmas on Dec. 25. Apple reached a 10-year deal with New York's Metropolitan Transportation Authority in July for the "marquee space," and paid $5 million to buy out the remaining eight years on Charlie Palmer's Metrazur restaurant's lease. The company is said to be paying anywhere from $800,000 to $1.1 million per year in rent for the prime location.